Charlotte J. Morrill, 85, of Syracuse, passed away on November 5, 2018 at Timbercrest Senior Living in North Manchester. She was born on November 28, 1932 in Jasper County, Indiana to Ernest & Gladys (Smith) Rees. She was a longtime area teacher, having taught in Milford and Columbia City schools for over 35 years. She was a member of the Calvary United Methodist Church where she was very active and sang in the choir. 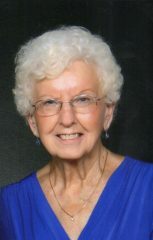 She was also a member of the Kosciusko Retired Teachers Association. She is survived by her son – Gary (Annette) Cook of Syracuse. 2 daughters – Diane (Charles) Scruggs of Noblesville & Rita (Mark) Pittman of Carmel. 13 grandchildren, and 30 great-grandchildren. 1 sister – Hazel Huffman of So. Bend. Her longtime companion – John Fisher of Syracuse. She was preceded by 3 sisters & 3 brothers. Visitation will be Friday, November 9, 2018 from 4-8 PM at the Eastlund Funeral Home. Services will be held on Saturday, November 10, 2018 at 11 AM at the funeral home with Pastor David Herr officiating. Memorial contributions may be made to the Calvary United Methodist Church.